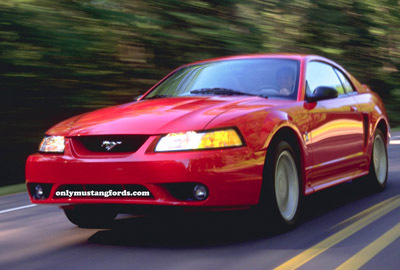 While the 1999 Mustang Cobra, or SVT Cobra was based on the newly face-lifted pony car, the specifications for this limited production marvel were not. The SVT designation signified that this was indeed a special vehicle, specifically designed to excel in all areas of performance. Ford's Special Vehicle team, a close knit bunch of top engineers and testers analyzed suspension characteristics, engine performance, handling and braking and using a combination of standard hot-rod and race track modifications, combined with special one-off pieces created a substantially better performance car. A quick look under the SVT Cobra's hood made that plain to see, even if you didn't realize that this Ford 4.6 liter V8 engine was completely different from it's stock cousin. The differences from the base Mustang and the 1999 Mustang Cobra was in the details. The front fascia or bumper cover was different, with a restyled lower chin spoiler and rounded fog lights. The only external option available was the ability to add a rear spoiler. The pony car's non functional hood scoop was replaced with a more aerodynamic smooth unit. And the grill area was de-chromed, removing the traditional corral from the classic pony emblem. A total of only four colors were available with the SVT Cobra; Ultra White, Rio Red, Electric Green and Ebony. Adding an open air experience (and another $4,000) to the SVT Cobra, enhanced the already powerful sound to the Ford Mustang hot rod. Peeking through the new Ferrari-like five spoke star shaped wheels, were performance disc brakes and calipers from Brembo, the exotic car brake manufacturer. 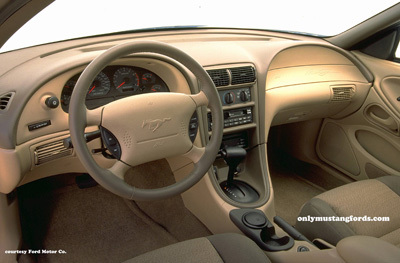 The interior of the Mustang SVT Cobra, led the charge for stylish and upscale sports car. With twin color accents and easy to read gauges, it was both functional and great looking. 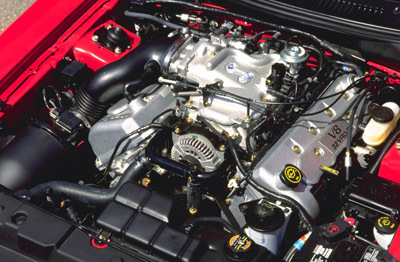 The crowning achievement of the 99 SVT Cobra was it's 32 valve, DOHC (dual overhead cam) V8 engine. Changes to the engine included massaging the intake port real estate for better flow and reshaping the combustion chamber which produced increased power and torque. A new Coil-on-plug ignition system and modified knock sensor system, similar to the Mercedes AMG supercars was added, allowing for precise tuning of spark and fuel. The end result, was the 4.6 liter V8 churning out a surprising 320 horsepower and 317 pounds of torque. And getting all that power out to the rear wheels, was the Tremec built T-45. 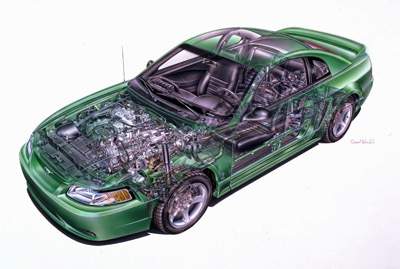 Strangely, while most Ford Mustangs were notably more powerful than their rating would suggest, the general opinion of testers at the time seemed to indicate that the new 1999 Mustang Cobra, was in fact slower than the previous incarnation, perhaps due to the pony car's new rear suspension. Nonetheless, Ford was listening and seemed to agree, because later in the year (August) they not only recalled all unsold cars, but sent notice to owners to bring in their cars for a specially authorized factory modification. With their reputation on the line, Ford replaced the intake plenum, ECU (on-board computer) and added a new better cat back exhaust system. All cars which were refitted, bore a new engine bay sticker with the words "Authorized Modification". Yes, I said Independent Rear Suspension. While some Mustang purists insisted that no pony car should ever have anything at the rear than a solid axle, many others were pointing to the fact that if Ford really wanted to say they had a supercar beater, then they needed to improve handling. And the only way to get much better than what they'd already achieved, was by having an independent rear suspension system. The benefit to having each end of the car able to move independently, is that under cornering and uneven road surfaces, having one corner locked to the other, results in loss of grip at particularly bad times. Having an IRS equipped car also allows you to improve (soften) the ride quality of the car, without affecting handling. Unsprung weight was also reduced, helping increase response and making for quicker direction changes. And with a Price starting at just over $27,000 that's a lot of car for the money. Who says lightening doesn't strike twice? The all new 2015 Ford Mustang's suspension will again move away from the solid rear axle, which has had every last bit of refinement squeezed from the tried and true suspension and drop an all new independent rear suspension into the new S550 chassis for 2015. Whether this change was brought on by the fact that it's closest rival, the Chevy Camaro sports an IRS or the fact that most every modern high end sports car uses this technology, you can expect Ford to make this new suspension perform to even higher standards than the previous one.